View of Black Creek Corridor in the Town of Esopus.Robert Rodriguez, Jr. 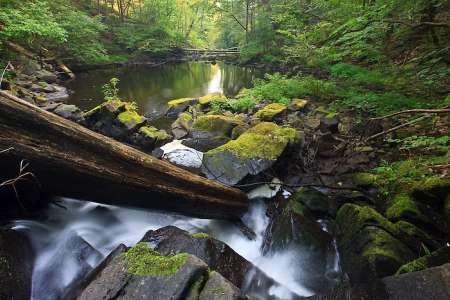 This land consists of forests, meadows, marshes, impressive rock ledges and nearly a mile of Black Creek shoreline. The portion of the creek passing through the property features a series of stunning waterfalls. This purchase brings to 910 acres the land we’ve protected in the Black Creek Corridor—which includes ecological, scenic and recreational resources along more than two miles of Black Creek and its environs. The corridor is part of the Plutarch/Black Creek Wetlands Complex, a prime area for breeding and migrating waterfowl identified in the New York Open Space Plan—a blueprint for the state’s land-conservation efforts. The property will be preserved and made available for public uses including bird-watching, kayaking and picnicking, as well as for scientific research. Further, safeguarded lands in creek and river flood plains will mitigate ecological and property damage from sea-level rises and storm surges under predicted climate-change scenarios. The purchase is part of Scenic Hudson’s collaborative campaign to Save the Land that Matters Most, protecting 65,000 acres of great scenic, ecological and agricultural significance.